H&M has certainly been busy of late and we are very happy to see its spring 2015 campaign take on a boho charm. We have pop singer Florrie representing the Swedish multinational retail clothing company in the newest H&M spring 2015 ad release showing off the looks of the next season. It may still be winter here, snowstorms and icy weather and all, but it’s never too early to start preparing our spring wardrobes, particularly if February promises temperatures around 10 degrees Celsius. The 26-year-old British singer and songwriter is also the face of the H&M Loves Music collection. It was recently announces that the brand would be releasing new merchandise designed in cooperation with Coachella, the music and arts festival held annually for two weekends comprising of 3 days at the Empire Polo Club in Indio, California. It’s located in the Inland Empire’s Coachella Valley in the Colorado Desert. There are multiple instalments to this Love Music campaign and Florrie has taken the front end of the brand’s latest looks for the upcoming months. 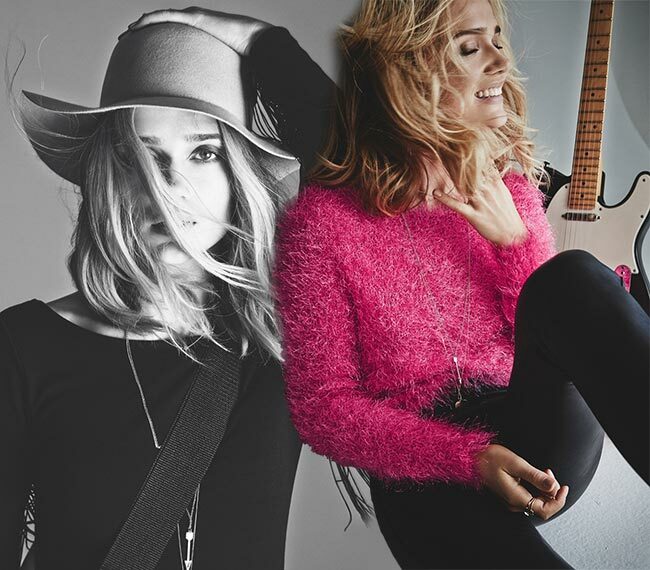 “H&M has a strong heritage of aligning itself with top talent; working with up-and-coming musicians like Florrie is a great way to create an affiliation with young consumers and ultimately generate further interest in the brand’s core product offering,’ stated Emma Grede, the chief executive of a brokerage linking entertainment and fashion, known as ITB Worldwide. Florrie has stepped out into the limelight here wearing the season’s trends of fringe, denim and hats, all of which present the Divided collection set to hit stores and online on January 22nd. This one’s all about music and Florrie has trouble containing her excitement. “It’s a brand that I’ve always loved and have shopped. Style means something different to everyone. Music and fashion are both ways of expressing yourself creatively, and both are very personal things,’ says the artist. Black tight leather leggings that are thick and look rather comfortable are a major look overall, with the material definitely making multiple appearances throughout the collection. The hairy hot pink fluffy angora sweater looks amazing with the look, larger in size so that its looser look counteracts the tightness of the lower body’s garments. Add some longer chains and pendants to the mix and enjoy playing that guitar because you look fabulous! We thought the kimonos were out but H&M’s definitely keeping to last year’s style in this and adding a loose fringed white top and leather mini shorts to the mix, thus effectively bringing gorgeous floral prints on a satin look to the grunge-type fashion sense. Needless to say, we absolutely love, it, particularly when accessories with longer gilded chains and blue stone pendants. Yee-Haw!! Tis a rodeo we are getting ready for here it seems, with the lovely loose floral print mini dress covered over with a svelte black fringed sweater (the fringes both on the sleeves and the shoulders at that) to enjoy the gentle spring breeze in. A couple of gilded rings and a choker necklace will do the job nicely in adding classy to the more edgy look, turning it into something positively pretty.